Some think growing up in a small fishing village has its disadvantages. No movie theater, skate board park, or malls to hang out at. The reality is, in a small coastal town, you have is the biggest playground there is: the beach and the ocean. Ken Dyer’s playground was the small islands off the coast of Belize. Long Key and Water Key were his favorite places to explore as his father and uncles fished lobster and reef fish to support their families. When he tired of swimming, fishing or just exploring, he would whittle figures out of the pieces of wood he found washed up on the beach. He began sculpting birds, mostly seabirds that inhabited the aquatic areas where he spent most of his time. By the time he was 14, he became so good at his hobby that he was making replicas of Harrier Jump Jets and selling them to British servicemen stationed in Belize. He was selling them as fast as he could produce them. When he had the time, he continued to sculpt creatures that lived in or near his first love, the ocean. 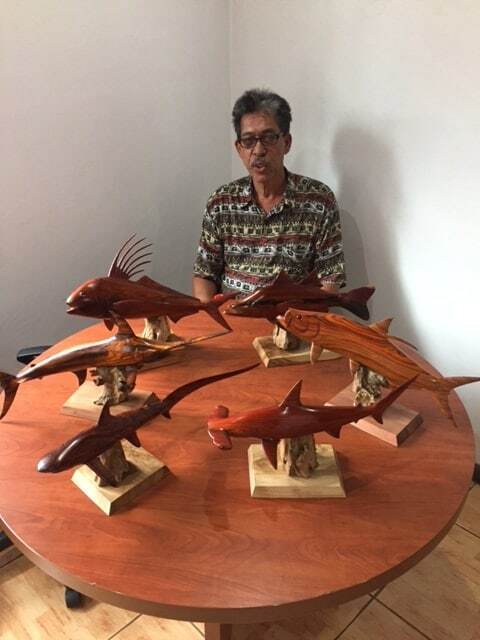 Fifty years later, he still makes a living bringing things to life in wood. He went to Hawaii with his family and his niche became humpback whales that tourists quickly bought up after doing a whale tour. Twenty-six years ago, his wife’s job transferred her to Costa Rica, and he has been here ever since. In Costa Rica, Dyer found sport fish to be his most lucrative subjects. When he first arrived, tourist sport fishing operations were popping up all along the west coast, and the tarpon lodges on the Caribbean side were filled with visiting anglers. His sailfish, marlin, dorado, tuna, roosterfish, snook and tarpon replicas were soon in high demand. 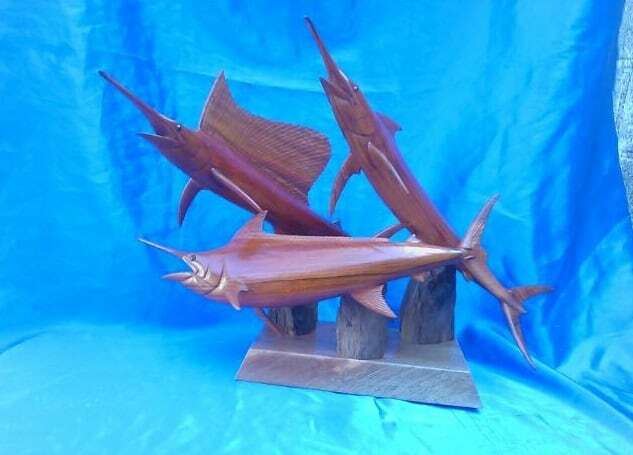 Even today, his favorite subject is the blue marlin, and he has made replicas of them up to 6 feet tall. He will custom sculpt almost any item and once did a replica horse head that was ordered by someone who really loved an equestrian friend. He says modern technology has made him a more precise craftsman. His favorite materials to work with are local hardwoods Ron Ron and Coco Bolo. According to Hawksnest Millwork, Ron Ron is extremely heavy and durable, with stunning grains that age to a bright red or reddish-brown hue with nearly black stripes. Coco Bolo is a dense, heavy, durable hardwood which is native to Costa Rica and Nicaragua. Heartwood color has enormous variation from light to deep red with highlights of countless other hues. Dyer explores lumber yards for materials to work with. What might be just a piece of scrap to some, he turns into amazing art. Technological changes in the tools he works with has also contributed to his success. Now, small grinders can take a block of wood down to the basic shape he needs before he works in the details that separate his work from others. He can take a block of wood and turn it into a 17-inch finished product in as little as five hours. Some of his most astonishing work has been created from the entire raw root systems of these native trees; such a piece takes him months to finish. Dyer’s work has been showcased over the years in some of the most notable seaside gift and souvenir boutiques and art galleries. 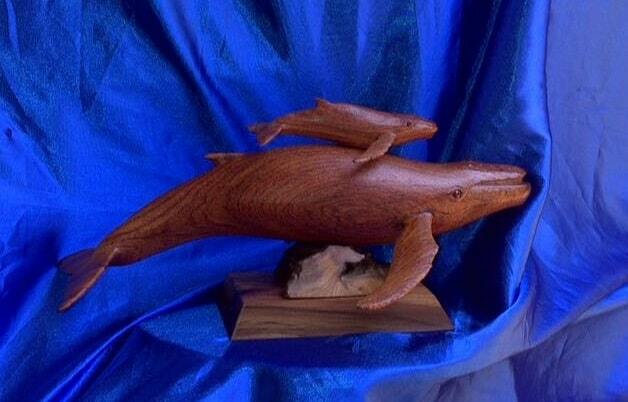 His work is also available direct for custom orders both wholesale and retail. He can be reached locally at 8918 5983, or by email at kencdyer@yahoo.com.